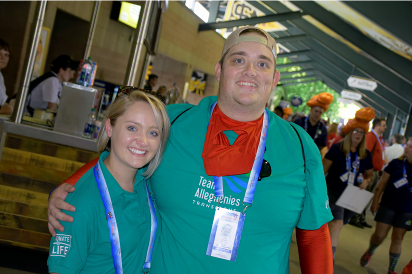 PITTSBURGH, Aug. 10, 2018 – A delegation of 35 athletes representing the Center for Organ Recovery & Education (CORE) and Team Alleghenies brought home nearly 50 medals from the Transplant Games of America in Salt Lake City. The Transplant Games of America is a multi-sport festival event that celebrates organ, tissue and cornea donation. 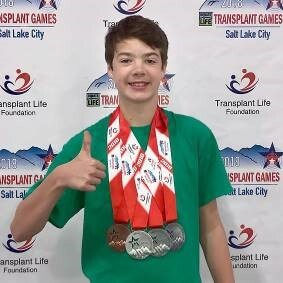 Participants from across the United States travelled to Salt Lake City for the five-day event on August 2-7, 2018.
Notable winners include several area transplant athletes. Additionally, heart recipient Luke Ball, 15, of Cranberry, won three silver medals in track and field (shotput, discus and softball throw), and a bronze medal in cycling. (Above left) Heart recipient Brittany Grimm, 22, of Fairview, won three silver medals and one bronze medal in swimming as well as one bronze medal in the bean bag toss event. (Above right) Heart recipient Craig Smith, 29, of Johnstown, won a bronze medal in the bean bag toss during the recent Transplant Games of America. (Above) Ezra Hildebrand, 38, of Washington, is a kidney and pancreas recipient. He earned bronze medal in men’s doubles golf and competed in volleyball and bowling events during the recent Transplant Games of America. (Above) Heart recipient Luke Ball, 15, of Cranberry, won three silver medals in track and field (shotput, discus and softball throw), and a bronze medal in cycling during the recent Transplant Games of America. 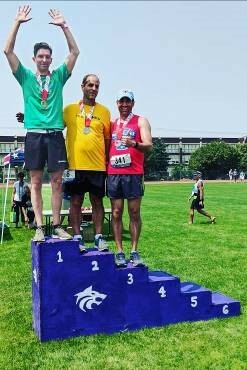 (Above) Living donor Chris Yanakos, 40, of Pittsburgh, won gold in the 400 meter and silver in the 100 meter events during the recent Transplant Games of America. His mom and recipient, Susan, won two gold medals in 5K cycling and 20K cycling events. The Transplant Games of America® is a 501(c)(3) non-profit whose mission is to promote organ, eye, and tissue donation, as well as to bring awareness to the tremendous advances in the field of transplantation and in the development of immuno-suppressant drugs in the pharmaceutical industry. For more information, visit http://www.transplantgamesofamerica.org/.